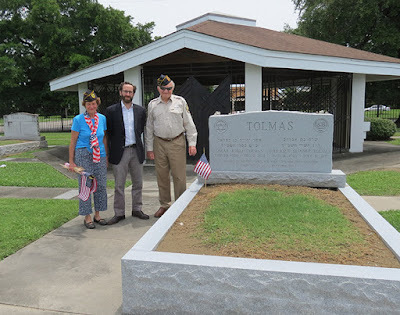 On Memorial Day, Jackie and Judge Sol Gothard, Commander of the Jules Lazard Post 580 New Orleans Jewish War Veterans of America, and Rabbi Gabe Greenberg of Congregation Beth Israel placed an American flag at the gravesite of Oscar J. Tolmas in Beth Israel Cemetery. Tolmas served in the Navy during World War II. In just over a year of existence, the Oscar J. Tolmas Charitable Trust has been very active, making major gifts in the New Orleans Jewish and general communities. Gates of Prayer Rabbi Robert Loewy said what the Tolmas Trust is doing “is similar to the will of Judah Touro” in its scope and effect on the Jewish and secular communities. Tolmas was born in New Orleans in 1920 to parents of Russian and Polish origin who had immigrated in 1915. He graduated from the Tulane University School of Law and was a member of the Louisiana Bar for 70 years. He fought in the Pacific Theater in World War II, then practiced law with his siblings until 1948, when he became interested in real estate development. The Tolmas Tract in Metairie has been the largest undeveloped tract on heavily-commercial Veterans Boulevard, but it will soon become the site of a development that includes the first Trader Joe’s in the New Orleans area. In 1952 he was bitten by the horse racing bug, and began Tolmas Racing Stables, and had racing silks in the motif of the Israel flag. He became so involved, in 1992 he was asked to chair the Louisiana Racing Commission. In 1963, he married Marjorie Ella Skinner, who was chief of nursing at two New Orleans hospitals. They did not have any children. She died in September 2013, and he died just over two months later, on Dec. 2. He left his entire estate to form the Trust, which was approved by the IRS in July 2014. This month, three major gifts in the Jewish community were announced. The New Orleans Jewish Community Center received a $1.5 million gift toward its capital campaign, which seeks to raise $8 million for expanded facilities at its Uptown campus. The JCC’s aquatics center will be named for Tolmas. At the 10 Years Forward anniversary weekend at Beth Israel in Metairie on Aug. 23, an announcement was made that the Trust is making a significant gift to Beth Israel to fund the Oscar J. Tolmas Rabbinic Chair. The congregation presented the trustees with a Gary Rosenthal Tzedakah box in the shape of a New Orleans streetcar. Later that week, Gates of Prayer announced the Trust was providing a “significant gift that will help to fund a variety of activities” with new Assistant Rabbi Alexis Pinsky, who will be reaching out to the 20- and 30-something community. In April, the Jewish Children’s Regional Service announced that the Trust was underwriting the major expenses of the agency’s Chanukah gift program. The program currently serves approximately 200 Jewish minors and residents of state institutions, clients of the social service agency. Each recipient receives eight small gifts, one for each night of Chanukah. Many gifts have been made in the general community. A scholarship named for Tolmas will be presented by the Folds of Honor, which provides provide educational scholarships for children and spouses of military service men and women killed or disabled during service. The Creativity Hub at the new WYES-TV Media Park will be named for Tolmas. The $20 million Breaking New Ground campaign will construct a complex for production and educational outreach. The Hub, which will be the second floor, will be used for the creation of content for productions. The Trust also funded the Louisiana SPCA’s animal shelter in the Junior Achievement of Greater New Orleans BizTown program for the 2015-2016 school year. An upcoming improvement at City Park will be the Oscar J. Tolmas Center, which will serve as the main entrance for the Botanical Garden and Storyland, with ticketing for both venues accommodated. The building will serve as an information center for Park visitors and will include access to light refreshments and expanded restroom facilities. An addition houses the expanded gift shop and an adjacent exterior retail area includes space for plant sales, garden accessories, and novelties. The entrance will be across from the Goldring/Woldenberg Great Lawn. The Louisiana Philharmonic Orchestra announced a new program, Soul Strings for Kids, made possible by the Trust. Starting in the fall, the orchestra will provide music-informed therapy to students at St. Michael Special School. St. Michael Special School is designed to help students with major learning difficulties that hinder their ability to achieve success in a regular class setting. The Trust also made a donation to Shriners Hospital for Children to purchase a new van, used to transport area children to Shriners hospitals in Galveston and Shreveport.